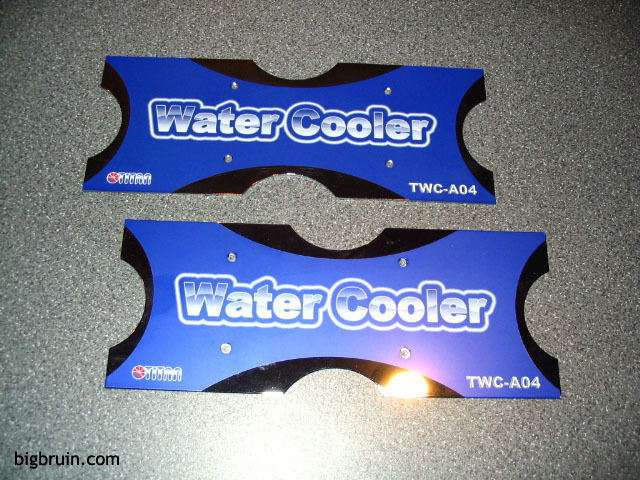 Water cooling systems for computers have gone mainstream, there is no question about it. Perhaps even just a year ago they were still considered to be for the extreme enthusiast determined to get the most out of their systems as possible. 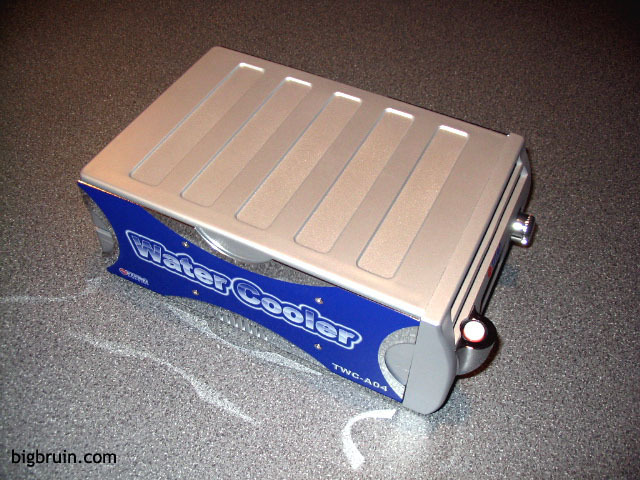 As we have seen in recent news and reviews, water cooling systems are available in all shapes, sizes, and price ranges, allowing the performance and silence to appeal to a whole new set of potential customers. 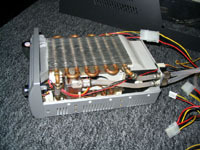 The water cooling system being reviewed was provided to BigBruin.Com directly by the US office of the manufacturer, Titan Computer Company, Ltd. Titan Computer Co. is a manufacturer of computer cooling products based in Taiwan, but with two factories in mainland China. 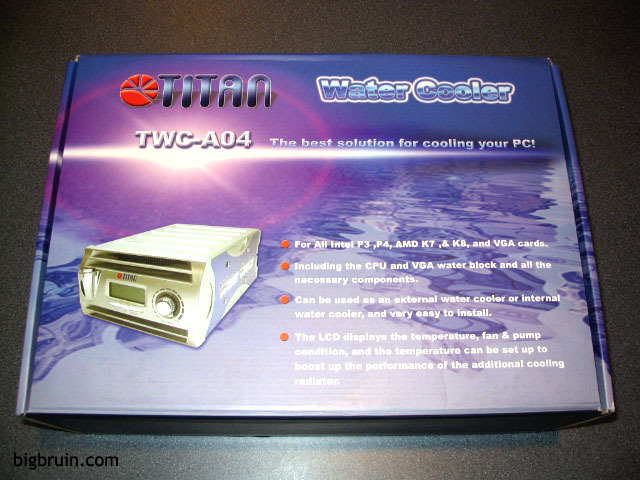 In addition to their line of CPU coolers, VGA coolers, drive coolers, and other related devices, Titan has recently launched the TWC-A04 water cooling system. 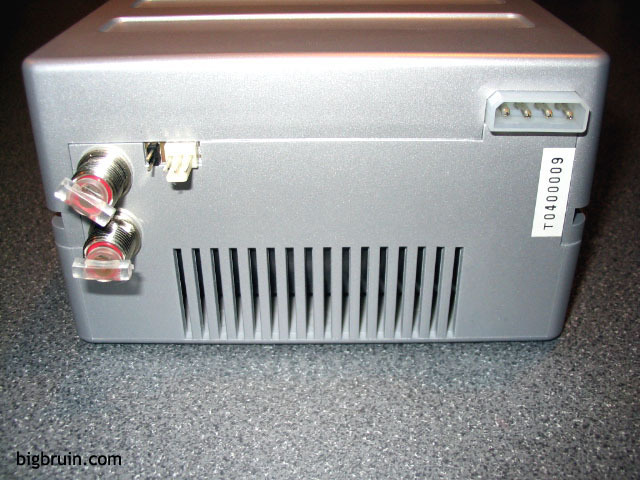 A quick look at the basic features of the TWC-A04 are quite intriguing! 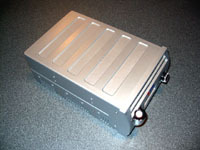 It provides the flexibility for cooling all Intel P3, P4 and AMD K7, K8 processors, as well as most standard VGA cards, in a system that can be mounted internally or externally to your case. 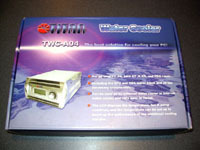 The TWC-A04 comes well packaged in the heavy duty box with handle pictured below. 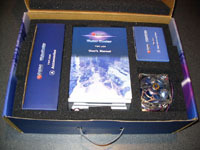 Every component is tucked into a pocket of foam padding, and nothing is able to move around inside the box to potentially damage itself during transit. 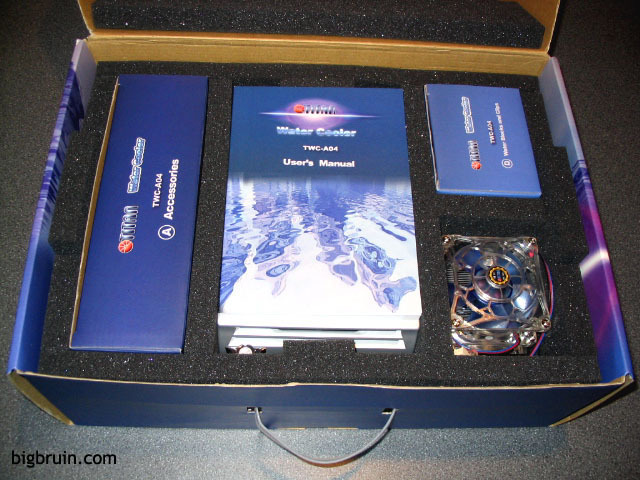 The box contains all the components/hardware you will need for the installation (except the distilled water), and they are all well labeled and documented in the rather substantial user's manual. The manual may not always have the best English description of what needs to be done, but with the abundant pictures and sketches, assembly should be fairly easy for anyone comfortable enough to open up their case and try. The main components of the kit are the main cooling system, the secondary radiator, the CPU water block, and the VGA water block... All of which will be examined in detail below. 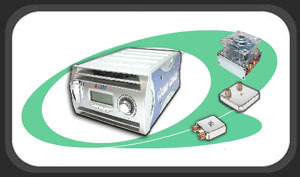 The first component that caught my eye was the main cooling system, pictured in the images below. It is a silver plastic box with electrical and water connections on the back, plus controls and a fill port on the front. 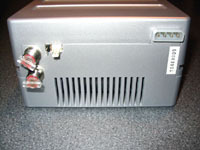 The rear connections consist of a 4-pin power connection for the unit, a 3-pin fan header that powers the secondary radiator fan, a 2-pin connector for a thermal probe, and two threaded fittings for water in/out. 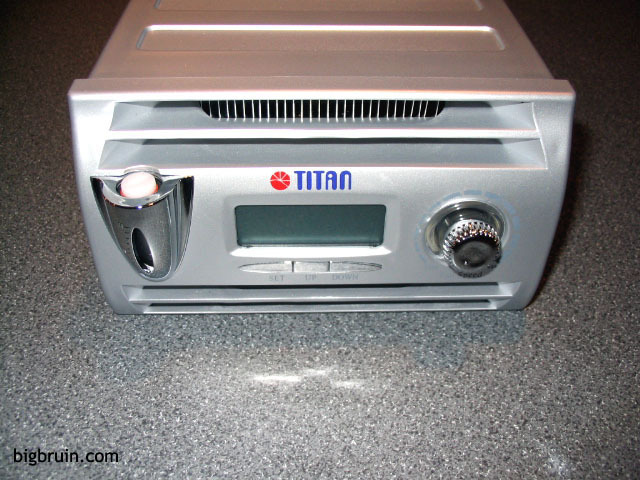 When in use, the display glows blue from the backlighting, and information is displayed such as relative fan speed, and the temperature measured by an included thermal probe. The fill port includes a sight glass for viewing the reservoir level that is also enhanced by a blue backlight while powered up. 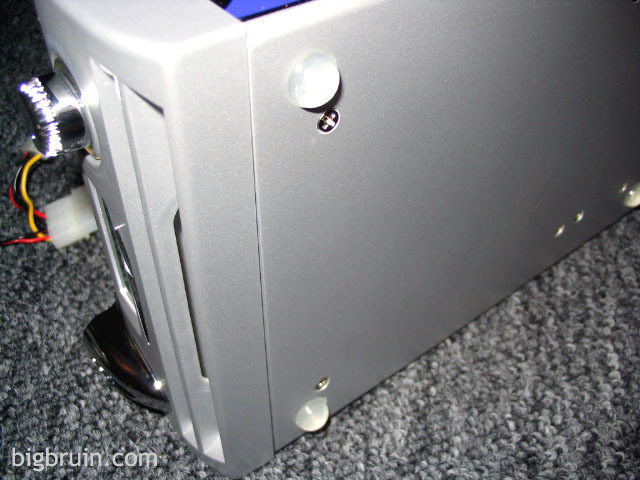 The entire main cooling system (MCS) can be slid into your case, and will occupy two adjacent 5.25" bays. 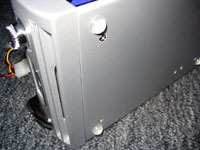 Holes in the sides of the box will match up to your drive rail slots to allow you to secure it like a typical optical drive, etc. For this installation, I intend to use the external mounting option, in which case there are two decorative steel plates to bolt onto the sides of the MCS, as pictured below. Out of curiosity I had to open the housing to see what we were dealing with. 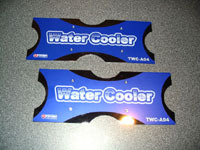 The below left image shows the inner workings of the device, which offers a unique approach to water cooling. The black box on the right-hand side of the unit is a blower which draws air in at the top, across the 8 pass radiator shown, and expels the air out the bottom across an identical 8 pass radiator. 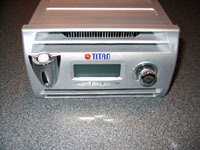 With the housing fully assembled, the air is guided in/out through grills on the front of the unit. In the center of the housing is a rather small, clear plastic reservoir with a submersible pump inside. 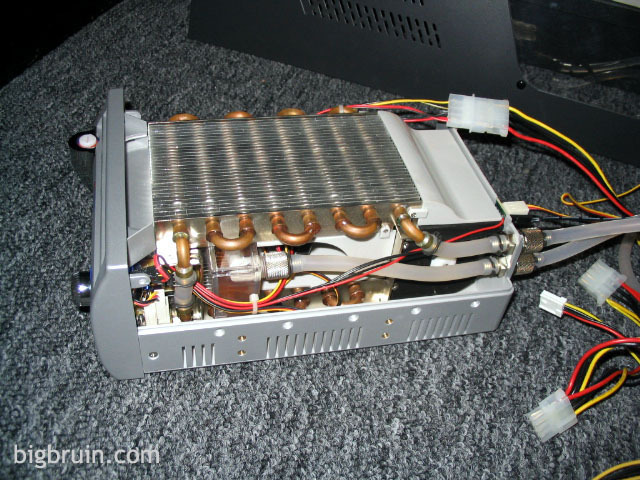 With the rather impressive array of copper tubing and aluminum radiator fins present, the pump/reservoir combination looks a bit small and cheap to me. The kit also includes four clear rubber feet for use when installed externally. 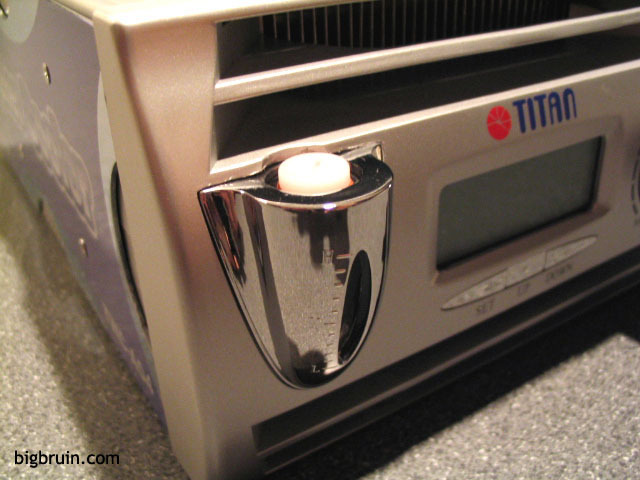 As pictured in the above right image, an adhesive backing holds the feet to depressions in the base of the unit, and should help reduce potential noise and vibration.